The Octoroon or Life in Louisiana : a play in four acts by Dion Boucicault. First performed in the United States at the Winter Garden Theatre, New York in 1859. The play was first performed in London at the Adelphi Theatre in 1861. The Octoroon is the story of doomed love. It has all the elements of a good melodrama; murder, threatened poverty, a thwarted love affair and a suicide, or if playing to a London audience, a happy ending. 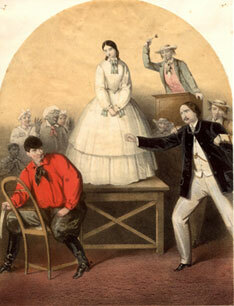 Boucicault set this play in the deep south of the United States. Zoe Peyton, the central character is the daughter of Judge Peyton who owns Terrebonne, a Louisiana plantation. Judge Peyton's death is the catalyst of the play. Zoe falls in love with his nephew George, recently turned to Louisiana from France. George in turn falls in love with Zoe. However their love is doomed. Zoe has been raised as the daughter of the Judge but her mother was not the judge's wife. Her real mother was a slave, with whom the Judge had been having an affair. Octoroon means "one-eighth blood" and even though Zoe had been raised as a white southern woman she could never marry George as American anti-miscegenation laws forbade marriage between blacks and whites. On top of this Boucicault throws an imminent bankruptcy into the mix. The Judge's wife has been left penniless by his death and a cheque which could have saved them all goes missing. As a result Terrebonne goes up for auction and Zoe, who thought her father had given her freedom, discovers that this was never made legal and is declared a slave and put up for sale along with the rest of the plantation. The evil villain in the Octoroon is Jacob M'Closky, the overseer of Terrebonne. He is also in love with Zoe and is determined to own her. At the beginning of the play M'Closky waylaid the slave, Paul, who had been sent to collect the mail bag from the river boat. In the mail was the fateful cheque on which the Widow Peyton had been pinning all her hopes. However, M'Closky murdered Paul, stole the cheque and the bankruptcy continues with M'Closky putting in the highest bid for Zoe. Boucicault harnesses quite a few special effects in this play and introduces some modern inventions. One, a camera, helps bring McClosky's action to light. Paul and a native American, Wah-no-tee, had been playing with the camera before McClosky's attack. Unfortunately for McClosky the camera took a photograph as he committed the murder. After the auction McClosky grants Zoe one more night in her old home, however once she leaves the scene another plantation worker, Salem Scudder, arrives with the fateful photograph and McClosky is unmasked but escapes. Wah-no-tee follows to track him down. The Widow Peyton finally gets her cheque and the bankruptcy auction is cancelled. Zoe, not knowing that she is saved, returns to Terrebonne, takes poison and dies. Or at least she does in the American version of the play. Boucicault discovered that the heroine's suicide did not go down well with London audiences and changed the ending so that Zoe and George ended up together. This printed edition of the play is part of the Melville Collection and includes printed musical parts. This printed edition of the play is part of the Pettingell Collection. These seven printed editions of the play are part of the Pettingell Collection. Some have additional typed cast lists and handwritten notes throughout the text. This printed edition is part of the Calthrop Boucicault Collection. Entitled The Octoroon or The lily of Louisiana this is an unabridged reprint from the Halfpenny Journal, Vol.1, 11 Nov 1861-17 Mar 1862. Written by Mary Elizabeth Braddon in 1862 it is based on the Boucicault play.